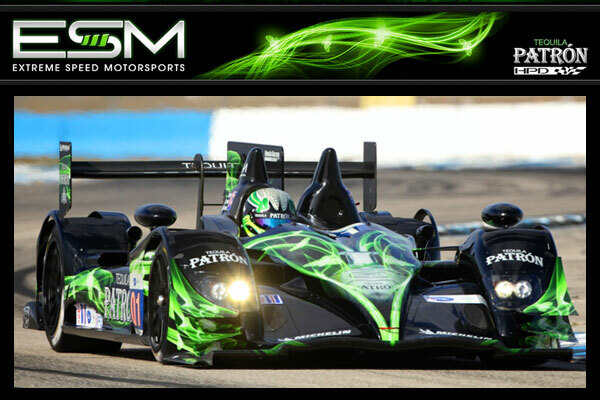 STUART, Fla., Tuesday, April 16, 2013 – One year ago, the Tequila Patrón-sponsored Extreme Speed Motorsports (ESM) earned its first podium finish of the American Le Mans Series (ALMS) presented by Tequila Patrón season through the challenging streets of Long Beach. This year, ESM has two new P2 racing machines that look to stand on the Long Beach podium. The ALMS championship continues with Round 2 this weekend at Long Beach’s 11-turn, 1.968-mile temporary street course. The Tequila Patrón American Le Mans Series at Long Beach stands to be a tricky race for the Florida-based team - tricky in the fact that ESM knows the circuit having raced in the GT class there for the last three seasons. But there are plenty of unknowns ahead of the team as this is the second race of the season with the P2 machines and the first time with them through the concrete canyons of Long Beach. Looking to repeat his 2008 victory and 2012 podium finish, Scott Sharp and new co-driver Guy Cosmo wheel the No. 01 Tequila Patrón Honda Performance Development (HPD) ARX-03b. Having savored the podium finish last year, Johannes van Overbeek seeks his first prototype podium with co-driver Ed Brown in the No. 02 Tequila Patrón Honda Performance Development (HPD) ARX-03b. Balancing the power of the purpose-built prototypes through the unforgiving concrete walls of the street circuit should prove challenging yet rewarding for both the No. 01 and No. 02 entries. In addition to maximizing the performance of the race cars, the other Long Beach challenge is time. The two-hour race format classifies this event as a sprint race, which adds incremental pressure to the drivers and the teams. ESM and the other ALMS teams have a single two-hour practice session on Friday morning followed by the 15-minute qualifying session on Friday evening. Minimal track time needs to yield maximum results. ESM will look to leverage every minute of track time to ensure it has the best race-ready machines in the P2 class. It might be soon to talk about points, but following the 12 Hours of Sebring, Brown and van Overbeek are tied for third in the P2 points race. Not far behind, and tied for fourth, are Sharp and Cosmo. On the team side, ESM sits in second place. Every point is valuable, especially since the ESM team is looking to finish 2013 with driver and team championship titles. The Tequila Patrón American Le Mans Series at Long Beach is the second round of the 10-race ALMS championship and takes place on April 19-20. Qualifying for P2 cars is scheduled for 6:10 p.m. PT on Friday, April 19. Green flag is set for 4:30 p.m. PT on Saturday, April 20. ABC’s coverage begins at 1 p.m. ET on Sunday, April 21, and live coverage is available on ESPN3 starting at 7:15 p.m. ET on Saturday, April 20. “I’m super excited to go back to Long Beach since it is my favorite street circuit. The heritage, the history, and the event that Long Beach has become – they have certainly set the mark. You have to drive it aggressively, but as usual for a street circuit, it does have some pretty good passing opportunities. “As a sprint race, it is completely opposite of an endurance race in the fact that you’ve got to always go, go, go. You have to make use of any and all opportunities that you get - whether you pass in practice, pass a car for position – plus you need to factor in the walls around you. “I’m excited to be back in the P2 car for Long Beach. From our perspective, as we saw in Sebring, it is exciting for us to make the transition from the Ferrari over to the P2 car. Being a prototype everything is just a little bit better – the car brakes better, stops better, turns better. Those same things will apply to a low-grip street circuit like Long Beach. We have a bit more control of the car. It is a little easier, in my mind, to drive a prototype at Long Beach versus a Ferrari. “We’re still very much in the building stage of our P2 program. With only one race under our belt, we walked away from Sebring feeling like the team put in a tremendous effort to get us there and through the event. We learned a lot. The 2013 season is a learning year for us. I think the engineers had the chance to hone the setup a little more. The guys had more time on their hands to be able to cross every ‘T’ and dot every ‘I’ heading into Long Beach. “I’m looking forward to getting back to Long Beach. Two years ago was one of my better races there and I really want to do well there this season, especially in the P2 car. “We struggled a bit last year because Mother Nature caused all kinds of issues last year with rain. This is a tough race to begin with since we have so little track time, and the rain just through a wrench in the whole plan. We have a lot to do in the one practice session, and we’ll do everything in our power to make sure we are race ready for Saturday. “Although I know Long Beach well and have had success there, it’ll be a new experience in the P2 cars this weekend. “The limits of the P2 car are so much higher than a GT car so I’ll be challenged to find those limits in the few laps we'll have before the race. “Regardless of car type, street circuits require decisiveness, aggression tempered with a healthy dose of common sense and patience as the walls are unyielding. “What am I most looking forward to about Long Beach? LONG BEACH!! “I just love the energy at this event. Yes, the track is one of the best street circuits ever, the racing is always awesome and driving our Tequila Patrón P2s around the circuit will be exhilarating. But to me, Long Beach is all about the energy and excitement. The fan interaction is incredible, the surrounding events are fun and the city is alive. It’s just a great-feeling weekend. I’m pumped! “On a more serious note, the main focus is a good result. We are still new to these P2 cars and this class, but we are a driven and competitive group at ESM. We want to win this race, and we want to win the P2 championship this year. We’re here to compete."